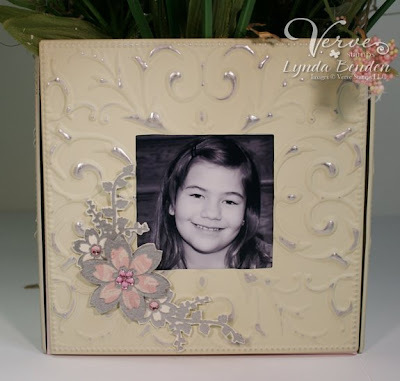 Verve Stamps: Project Parade Day 7: It's a Girl Thing! Project Parade Day 7: It's a Girl Thing! Hello Verve Addicts, Lynda here!!! Today is day 7 of this month's SPECTACULAR Project Parade and it is my turn to post!!! I hope you have enjoyed the awesome projects so far, I sure have!!! I LOVE all of the stamps included in this release so it was difficult to decide which to use for my project!!! I took Jen's "It's a Girl Thing" challenge in a little different direction. Because I no longer have my Wonderfule Mom or MUCH LOVED Grandmother to make gifts for, I decided to make something for MYSELF for Mother's Day!!! LOL!!! I know there has been some disappointment that Because of You is sold out and won't be available for purchase until after Mother's Day, do not despair, Because of You is appropriate for ALL occasions and is a VERY versatile set! Here, I'll prove it to you!!! LOL!!! 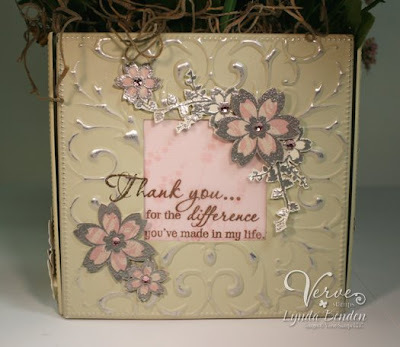 I stamped the the corner flower bouquet on Vanilla Bazzill CS using my Versamark and then heat embossing with Silver EP. I stamped it again as well as the single large and small flowers included in the set again using the Versamark and embossing with Silver EP on MME Bella Bella DP. I cut all the pink flowers out, added some pink Taylors Tiny Twinkles and adhered them using a combination of Tacky Tape and dimensionals. 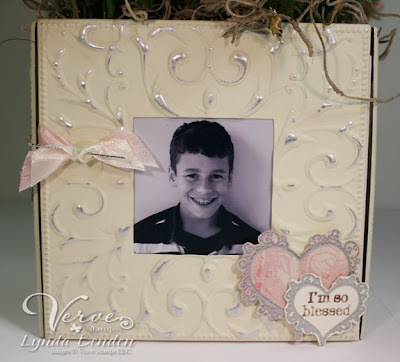 The sentiment was stamped on a piece of vellum paper and then again on the frame itself using Timber Brown Stazon. 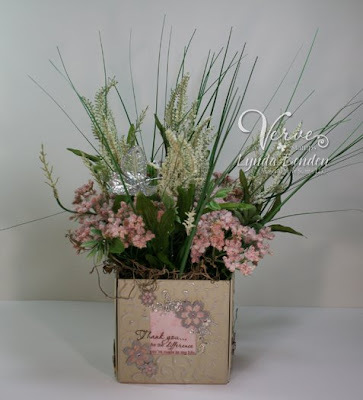 I stamped the smaller floral silhouette included in the set, using Pink Pirouette ink, directly on the box so it would show through under the vellum. I LOVE this sentiment and thought it was PERFECT for my Mother's Day present!!! LOL!!! I did the same with the flower bouquet on this side as the previous side. 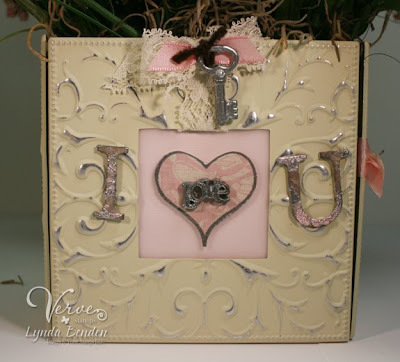 I stamped the large and small hearts using Versamark and heat embossed with the same Silver EP. The sentiment is from the Because of You set which I used my Close to Cocoa marker to ink it up since the sentiment is in a straight line and I needed it to fit inside the small heart. I then cut the hearts out and adhered them using Tacky Tape and dimensionals. I added some ribbon because there was an empty space!!! LOL!!! It actually looks better IRL!! LOL!!! The heart is from Hearts on Fire, the chipboard was sponged with Chocolate Chip ink and Vanilla ink and then heat embossed with pink and silver EP. The charms are from Making Memories. Here is my last picture ~ I promise!!!! 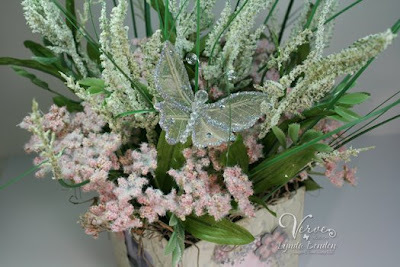 I just have to show you the darling glitter Prima butterfly! We'd love for you to play along with this theme! Just make a project or card that fits your style and celebrates a woman in your life. It can be any woman ... mom, grandmother, daughter, sister, aunt, friend, teacher - you get the idea! Then add your project link to the Mr. Linky form IN THIS POST before 8PM Mountain on Thursday, May 14. Two random participants will be chosen and win $25 gift certificates to the Verve Store. Have fun and good luck!